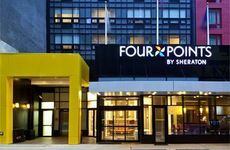 Find Four Points by Sheraton Midtown-Times Square deals, discounts and special offers. Located near theaters and restaurants, the non-smoking hotel features an Irish bistro and rooftop bar to open in 2010. This iconic 168 room Royalton, near midtown theaters, includes a reimagining of the famous Round Bar as the new Bar 44. This boutique hotel, with privileges at the Waldorf Astoria, offers permanent or short-term residence in antique decor. Located at Central Park, the landmark, 33-story Ritz-Carlton has 259 rooms, restaurant and spa. Super-deluxe services create a pied a terre ambience at this luxurious Midtown (Murray Hill) boutique hotel. A smaller, European-style boutique, the upper East Side Plaza Athenee rooms have enclosed terraces or outdoor balconies. Among the in-room amenities at the East Side San Carlos are Wi-Fi, On Demand movie and event service, & flat screen TV. The boutique-style, executive suite Chelsea Benjamin, ECOTEL certified, has pillow menu and 112 rooms, 97 suites. Upper East Side Madison Avenue landmark since 1930, the pet-friendly Carlyle has 60 residential apartments, and spa. Luxurious midtown Palace has beautifully-appointed rooms from Deluxe to a Triplex with terrace. Spa, dining & meetings. The 5th Avenue Peninsula, in 1908 Beaux Arts building, has a new spa, and a Naturally Dining program. There are just four suites in this very exclusive, 19th century townhouse Inn located on the upper West Side. With views of Central Park, the eastern-influence Mandarin, at Columbus Circle, has a spa and indoor lap pool. The only hotel in NYC's meat packing district, Gansevoort boasts a rooftop pool and loft, in exciting lower Manhattan.